Digging around on my local extension office’s website, I came across a great, succinct, yearly gardening calendar! (Can be found here.) Just a nifty thing to have around for reminders, eh? You can find your local extension office by googling “your state, your county, extension office.” Tons of great, local information! In the flurry of getting ready for baby, I messed around a bit with our school room. Time to re-assert the “school” part of that room! This school room is a sunken room, just off the kitchen- our house is a plain vanilla split-level, with a bump out on the back. The school room is part of that bump out. The kids like to hang out in there while I’m working in the kitchen, and inevitably loads of toys try to take up permanent residence. For now, they’ve been banished back to the basement playroom where they belong! 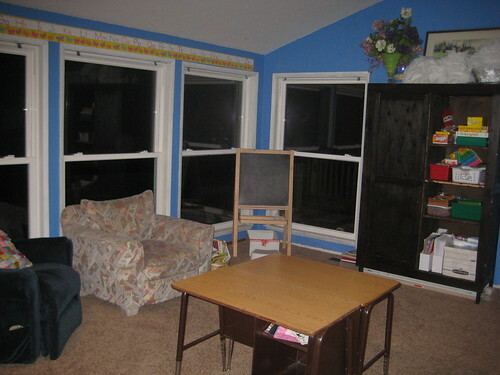 I want this room to be a tidy, organized, well-lit place for the kids to work and read. OK, so it’s not terribly well-lit in this photo, but it was about 9:30 at night, and I’d just finished organizing everything! The easel in the corner is great for math, practicing letters, note rhythm patterns, and keeping the two-year-old occupied. The opposite side is a white erase board- I don’t like it as much as the chalk, since the kids tend to smash the heck out of the markers in short order, and those pens will stain anything they touch. We get out our dry-erase markers as a special treat! I’m keeping the chalk in the art cupboard (see below) so I don’t have loads of chalk sitting out for toddler fingers to get into. The kids are free to get out the chalk when they want to work with it, and put it away when they’re done. 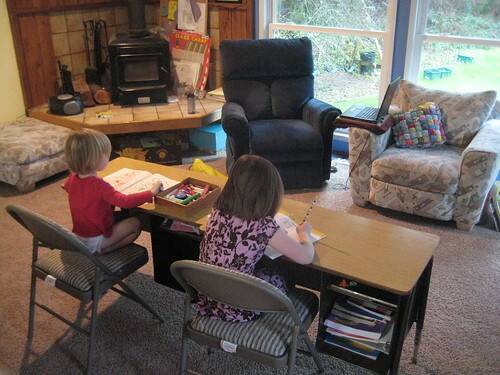 The nice thing about this room is that it IS centrally located- it’s not necessarily the space for open-ended free play, and I can remind the girls to put away their supplies. The chairs are big and comfy- perfect for story time with the little one while her big sister is working at her desk, and basically just perfect for getting comfy in. 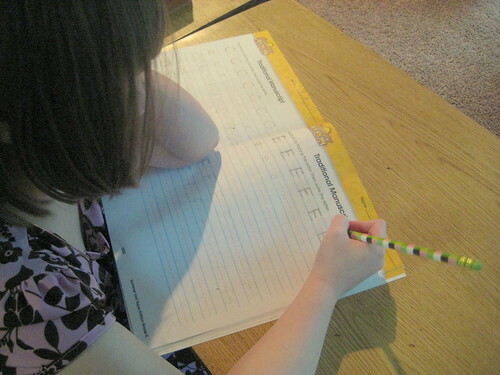 My hope is that I can nurse our tiny, and still keep the bigger girls engaged in school. You can’t see it, but there’s a big wicker basket STUFFED with our board books- Mimi will happily sit in anyone’s lap for an hour listening to these stories and pointing at the pictures! That will probably be a nursing-time activity as well, to help Mimi feel like Mommy still loves her, even though a small peanut wrapped up in blankets has taken up seemingly-permanent residence in my lap. The desks are probably vintage, from a local Freecycler- she had about 30 stacked up and ready to ship to an orphanage in India, but the shipping container was too full. All of Ernie’s workbooks are stored in her desk. 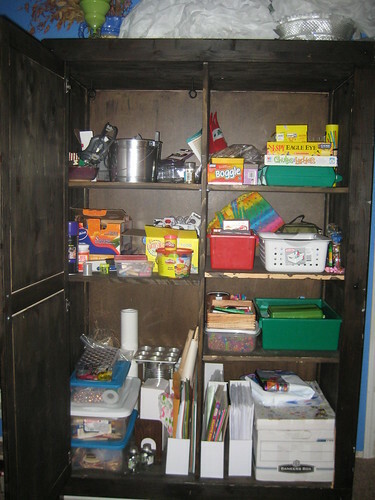 On the right are things the girls have free access to all the time- games, puzzles, card games, magnetic and paper dolls, their own drawing boxes, coloring books, scratch paper, and a big box of assorted crafty supplies like glue and scissors and stickers. On the left is the “mommy” side- paints, pipe cleaners, googly eyes, construction paper, ribbons, “saved from the recycles bin” craft supplies, little wooden things to paint and color on, large sheets of stickers, etc. I thought it would be a good time to assess what worked in 2010, what didn’t, and what’s FIRST on my list of things we want to add back into our lives. Cloth diapering. I’m going to just say it: we failed. My daughter has lactose issues, her urine acidifies very quickly, and her bottom is scarred from the blisters. I tried so many different things, but after a month on disposable diapers and NO lactose-related issues, I’m going to say this child is not going back on the cloth. And it’s possible we’ve seen the end of lactose-intolerance issues, within reason. (In the past, we barely made it a week without a fresh rash cropping up from too many slices of cheddar, or too many goldfish crackers at church.) Her little brother, I don’t know. I have an enormous stash of cloth diapers we found at an incredible price, and I’m not Craigslisting them. Not yet. I don’t mind the laundry, but it’s one more thing to remember to do in running this house. Also, after a year and a half of cloth diapering, I remained the only person who knew how to change her diaper and felt comfortable doing it. That’s bad. Homemade laundry soap powder. Probably not going back. The optical brighteners in commercial products are just SO nice, and the detergent is so much more effective on kids’ stains. Homemade dishwasher soap. Not going back. Our dishes were clean, but had water deposits on them and it was especially noticeable on the glasses. Yes, it took 2 years for them to get really bad, and only 3 or 4 washes with commercial detergent to get rid of them, so it could happen again maybe. Homemade bread. I REALLY MISS my homemade bread. I’m not willing to buy the good stuff at the store, so we get the cheapest, biggest, whitest loaf Costco carries. (Their cheapest wheat loaf is terrible- so little gluten development that you can’t spread anything on it without it tearing. Besides, I know the nutrition content is practically the same as the white loaf, so I don’t sweat it.) BUT, it’s nice to have bread on the counter for more than a day and still have soft crusts. The larger slice size is nice for sandwiches and toast, too. I want to add bread back, and I want to make it in bigger loaf pans, and perhaps use honey for the sweetener to help soften the crust. Eating store bought bread is depressing. Homemade soy milk. YES this is worth it. The beans cost about thirty cents for a 2-quart batch, and the work is minimal. The only effort is remembering to soak the beans before you run out, and cleaning the blasted strainer basket. Those microscopic holes clog in a heart beat. Plus, homemade tastes better. Way better. Handmade gifts. I could go on and on about this, but I’ve decided that making gifts that no one wants is sad. Sending gifts that are never acknowledged is sad. Sending HANDMADE gifts that aren’t acknowledge is then doubly sad. And I don’t have time to be sad. So going forward, I won’t feel bad about purchasing gifts to show my love for somebody. Only local fruits and vegetables. This winter I’ve brought home clementines, grapefruit, pomegranetes, kiwis, and cranberries. And they were delicious. I won’t buy cherries or blueberries from Chile. I’m not buying tomatoes (mostly, except for that night I had a preggo craving for really bad salsa apparently.) But in-season fruits that I just can’t get from around here at any time of year….I’ve caved. And I’m probably not going to change that. Vitamin C in the winter is just really, really good. (The rest of the year, I’m still aiming for local produce. It’s cheaper, fresher, tastier, and a better idea all around.) That said, we’re still eating local potatoes, carrots, beets, turnips, squash, storage apples, onions, etc. Homemade yogurt. Going back, definitely. It tastes better, is a fraction of the cost, and the only effort required is bringing the milk up to temperature and waiting for it to cool back down. For what we are currently doing, I intend of keep on doing them. They’re easy, effective, cheap, and wonderful. Outdoor composting. I’m a lazy composter- I throw weeds in a pile, top with a bunch of rotting straw from the last bale we purchased, turn it if I ever remember (or at least gather it into a taller pile when it starts breaking down) and 3 months later it’s dirt. Magical. Homeschooling. YES. This year has been loose and fun- lots of projects, lots of “unschooling,” lots of learning how to learn and how to learn from Mom. Next year we’ll do a formal curriculum, and I love it. She loves it. My younger daughter loves it. I love the structure. Organic gardening. We finally have the structure set up, the dirt in, and the seeds planned. I want my kids to have this as part of their lives. I want to make time to have it be part of my life. I want the exercise, the fresh air, and the responsibility. That said…I want a timed watering system. Really, really bad.